The SDK Mini EMF Printer Driver allows users to print any printable documents to image formats. Of course, you can also print image to image such as bmp to emf. Actually, Mini EMF Printer Driver is specially designed for software developers. It supplies virtual printer and interfaces which can be called by third part applications. 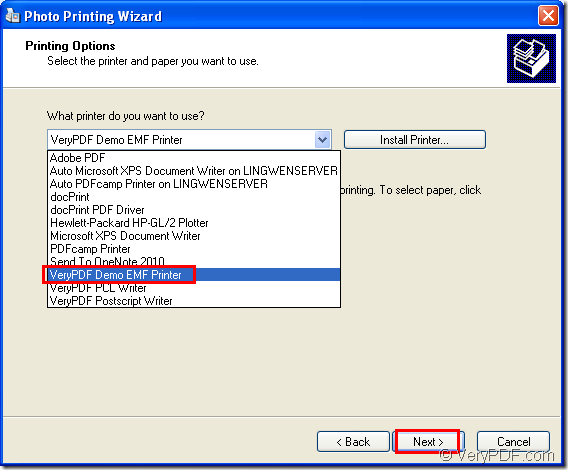 In this article, you will see how to print bmp to emf with the virtual printer in Mini EMF Printer Driver— VeryPDF Demo EMF Printer for it has the ability to print any printable documents to EMF image format. Please click here to download Mini EMF Printer Driver and install it on your computer. Then you will be able to print bmp to emf with VeryPDF Demo EMF Printer. To run the virtual printer, there are two situations you should consider. 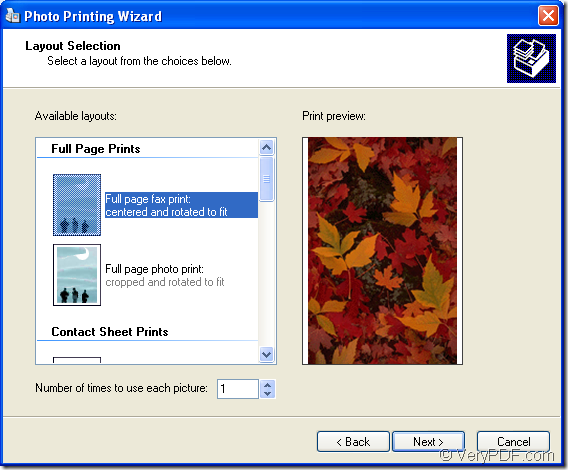 If it is the default printer on your computer, you should open the BMG image with some kind of image viewing program and click “File”—“Print” or directly use the combination “Ctrl”+ “P” to open “Photo Printing Wizard” window and click “Next” button. In next window, please check the images you want to print and click “Next” button. 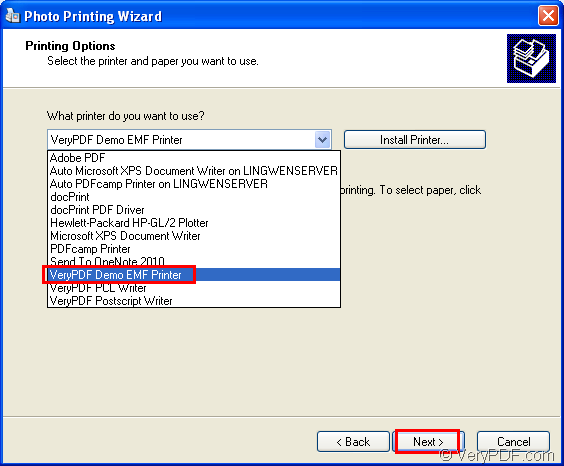 You should choose “VeryPDF Demo EMF Printer” as your printer in the following window and click “Next” button. Please see it in Figure 1. In next window, you need to choose output layout for the target file from all the supported layouts and click “Next” button for printing bmp to emf. Please see it in Figure 2. If you want to find the target file after the conversion, please find it in C":\ which is the default output location for the target file. If you want to change it as another one, please open the file by clicking the path “C:\Program Files\VeryPDF Mini EMF Printer v2.0\emf_printer_driver\option.ini” and find the command “OutputFile=C:\”. You just need to change current “C:\” as a new location. If you need the developer license, you can buy it at the following website: http://www.verypdf.com/order_miniemfprinter.html. Then you will never to pay for Mini EMF Printer Driver no matter what you want to develop and what components you need to redistribute with the SDK. Mini EMF Printer Driver also supplies the command line application for users to call in their applications to realize the conversion from printable documents to image. To obtain more information about Mini EMF Printer Driver, please click the following link: http://www.verypdf.com/artprint/mini-emf-printer-driver.htm. This entry was posted in Mini EMF Printer Driver and tagged bmp to emf. Bookmark the permalink.